For Valentine's Day, instead of candy and chocolates, we gave our daughter a stuffed cat (because she loves kitties) and our son a new book, Steam Train, Dream Train written by Sherri Duskey Rinker and illustrated by Tom Lichtenheld. That author/illustrator team may sound familiar to you as it is the same duo that wrote/illustrated the New York Times bestseller that I feature a few weeks ago, Good Night, Good Night Construction Site. 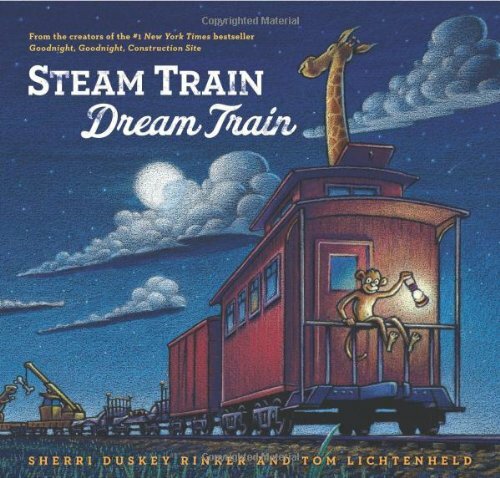 Steam Train, Dream Train is written with the same rhyming text as Good Night, Good Night Construction Site, but this time the story is about a train and it's many types of cars. The steam train is loaded up for the night by various animals. I love how this story integrates train vocabulary with regular children's items. For example paint fills the tankers, ice cream fills the reefer cars and balls are placed into the hoppers. After the train is full, you discover the train belongs to a child who is fast asleep in bed. It's been read at bedtime three out of the four nights we've had it and is quickly becoming a new favorite in our house. You should check it out too!